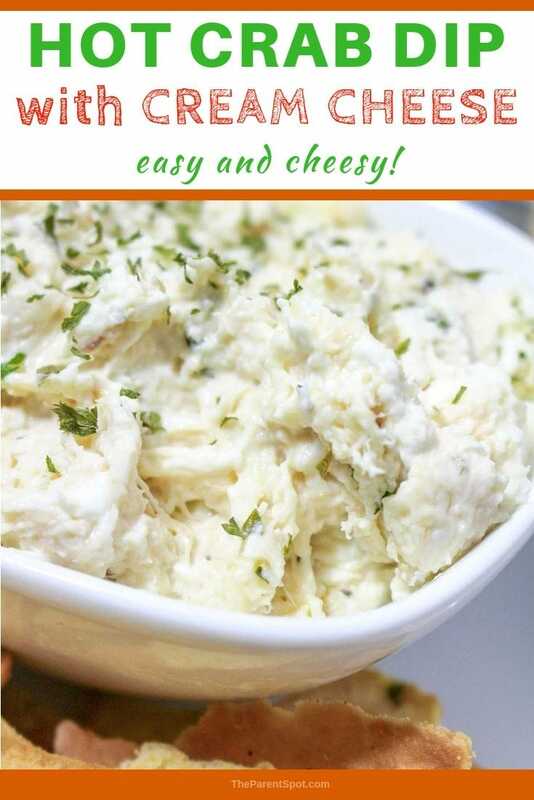 Imitation crab dip with cream cheese is a melty, delicious recipe that everyone will love! It’s made affordable with imitation crab (instead of pricey real crab), but it’s tasty, dipable recipe that’s perfect to serve piping hot to friends and family. This is a wonderful recipe to serve with another hot dip, like this easy Velveeta queso crockpot dip, or even a tasty cold dip like this bacon cheddar ranch dip recipe, or even a yummy easy taco dip recipe. Don’t forget the dessert dips like this Greek Yogurt fruit dip recipe! This is such an addicting dip – make sure you have plenty on hand for everyone to dip and enjoy. This is so easy, cheesy and good! This hot dip recipe is an irresistible appetizer that you can heat up and in half an hour or less! Don’t be intimidated by the ingredient list, this is actually an easy crab dip recipe that’s simple to put together. 8 oz cream cheese. 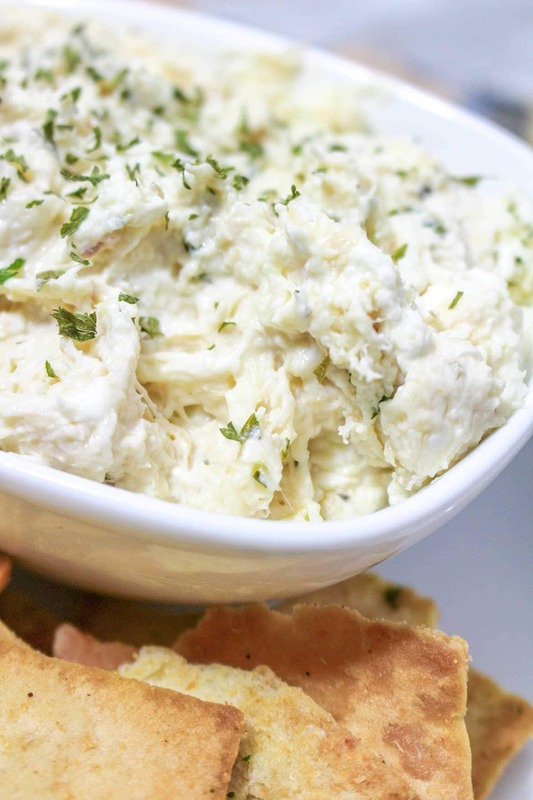 We like a name brand cream cheese like Philadelphia cream cheese for this crab dip. Philly always seems to make it turn out cheesy and creamy, with just the right texture. How do you make hot crab dip with cream cheese? Preheat your oven to 350 degrees. Mix ingredients in a medium bowl. Reserve 1/2 cup mozzarella cheese and 1/3 cup Parmesan cheese. Spread in a shallow 9 x 13 inch baking dish, and then sprinkle remaining mozzarella and Parmesan cheese on top. Bake 25 minutes or until bubbly, and sprinkle Italian seasoning on top. Enjoy! What do you serve with hot crab dip? 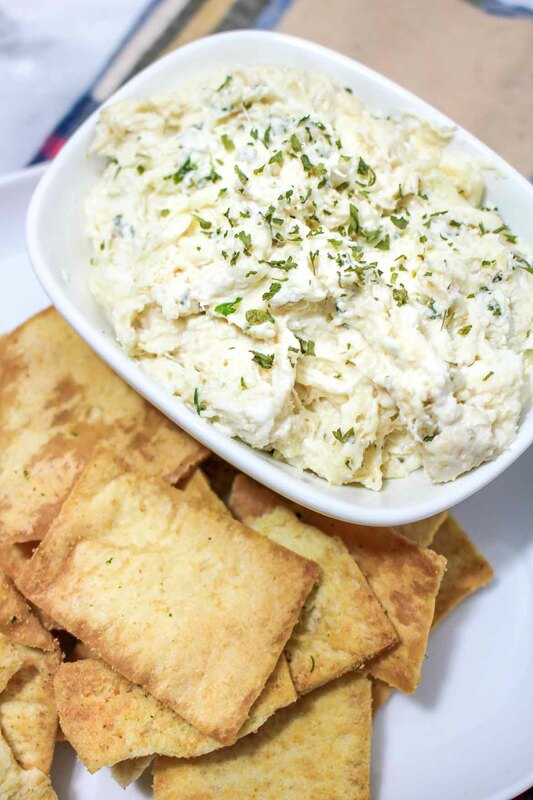 We absolutely love pita chips with this hot crab dip with cream cheese, especially these yummy Stacy’s Simply Naked Pita Chips. They’re amazing – crispy, and thick enough to hold up when dipping this hot, cheesy dip. The Stacy’s multi-grain and Parmesan and garlic flavors are delicious, too. And no, we didn’t get paid to say that – we really just love them! We also really love crostini and crackers served with this warm crab dip with imitation crab, or even chunks of fresh French bread. Try it with veggies like carrots, red and yellow pepper, and broccoli, too, and enjoy the best crab dip in town! Can you make crab dip ahead of time? Yes, you can make this imitation crab meat dip ahead of time. Just mix up the ingredients, and layer in the casserole dish, and refrigerate. Pop it in the oven about 30 minutes or until bubbly, and serve! Everyone will love this hot imitation crab dip recipe! Why do we use imitation crab? Real crab is delicious, but it’s quite expensive. We use imitation crab to cut the cost, and most people find that it tastes and looks very similar to the original. 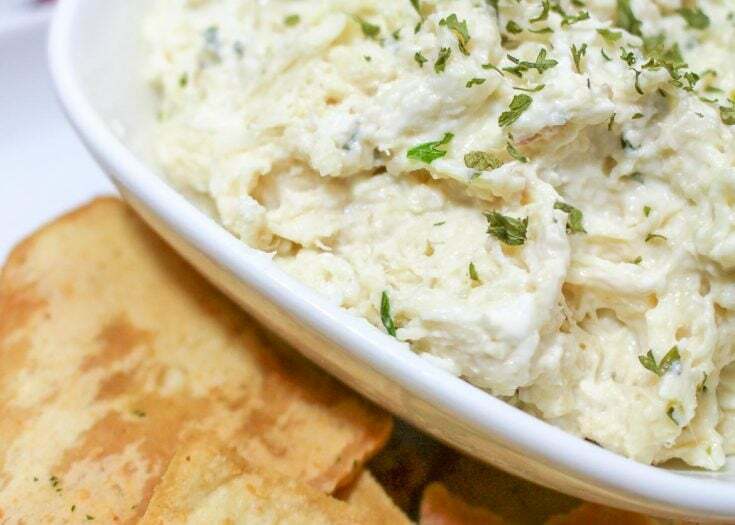 Our imitation crab dip with cream cheese is a hot, delicious recipe that everyone will love! It's made affordable with imitation crab (instead of pricey real crab), but it's tasty, dipable recipe that's perfect to serve piping hot to friends and family. Mix ingredients in a medium bowl. Reserve 1/2 cup mozzarella cheese and 1/3 cup Parmesan cheese. Spread in a shallow 9x13 inch baking dish. Top with chopped Italian seasoning. Serve with pita chips, crackers, chunks of French bread, or veggies.